While much of the focus on the current UK music scene is devoted to Britpop revivalists, there's a growing minority determined to remind you that the mid-90s was also primetime for glowstick waving raver kids. 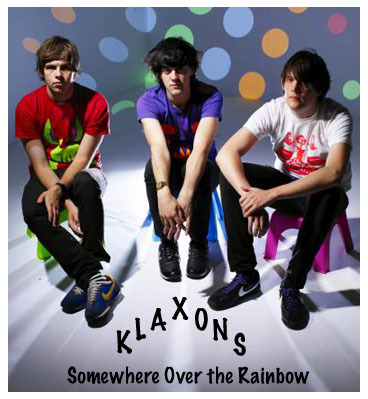 Heading up this new rave movement are Klaxons, a group who've created their own little world of spacey synths and guitar riffs. And with song titles like "Gravity's Rainbow" and a member who goes by the name Captain Strobe, these are some unabashedly trippy boys -- as much influenced by William Burroughs' writing as The Prodigy's big beat electronics. Checking in from Planet Klaxons, vocalist Jamie Reynolds gives us a look inside their world -- one that is about to expand with the October release of "Xan Valleys." Rock Star Journalism: How did you guys first meet and decide to form a band? Jamie Reynolds: We hooked up via the Virgin Galactic message board and shared the view that a band was the only way we'd be able to make enough money to buy tickets for the maiden voyage. RSJ: You've often mentioned being influenced by 90s rave culture; what is the most appealing aspect of that scene to you? JR: Vicks VapoRub and a potential Cyber Dog sponsorship. RSJ: Since you were all very young during that time period, what memories do you associate with that music? JR: Huge piles of flyers for out of reach parties and a strong smell of glue. RSJ: That was a scene in which music and culture were tightly connected; do you see the same thing happening in music scenes today? JR: Of course. Only things are just that little bit easier now -- you can dress like your favourite musicians by visiting any Topshop. RSJ: There is certainly a resurgence of mid-90s Britpop with current bands; do you think that the electronic culture of that time period is often overlooked? JR: By no means. There's a Big Beat Party in our town every night. RSJ: You've been labeled as part of the "new rave" scene. Do you think that's an accurate description of your music? RSJ: Does it concern you that getting a tag like that puts you in danger of being viewed as a novelty? How do you combat that? JR: Not at all -- we'll knock up the advent calendar in time for Christmas then close the lid on the box. RSJ: Though there is obviously a lot said about the rave influence in your music, you also have a lot of other elements. What other types of music have influenced you? JR: Cheers -- this summer's all about French Reggae/Baroque/Blue Cheese/Spacefolk and the current SlowSub Scene. RSJ: You do a number of covers, most notably "The Bouncer." How do you go about taking a song like that and making it your own? JR: Without letting the songwriter have any idea what you're up to. 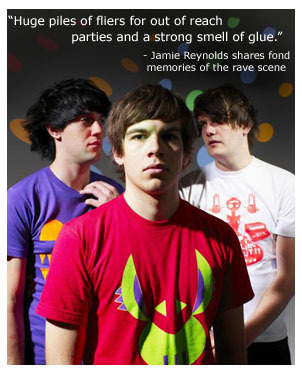 RSJ: Describe what one can expect to see at a typical Klaxons show. RSJ: What do you think would be the ideal setting for your live show? JR: Virgin Galactic's Maiden Voyage. RSJ: If you could build your perfect festival line-up, what bands would be there? JR: Freda Payne, Christopher Cross and Seal on piano. RSJ: Other than the one date in New York, do you have any plans to tour in the States? 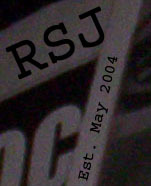 JR: The big man's got the plan -- coming sooner than an undercooked quarterpounder. RSJ: Where would you like to see your band in a year's time? RSJ: Finally, if you had to sum up Klaxons in one sentence, what would it be? JR: For their own sake they should slow down.